BackgroundThe Strengths and Difficulties Questionnaire (SDQ) is a tool to measure the risk for mental disorders in children. The aim of this study is to describe the diagnostic efficiency and internal structure of the SDQ in the sample of children studied in the Spanish National Health Survey 2006.MethodsA representative sample of 6,773 children aged 4 to 15 years was studied. The data were obtained using the Minors Questionnaire in the Spanish National Health Survey 2006. The ROC curve was constructed and calculations made of the area under the curve, sensitivity, specificity and the Youden J indices. The factorial structure was studied using models of exploratory factorial analysis (EFA) and confirmatory factorial analysis (CFA).ResultsThe prevalence of behavioural disorders varied between 0.47% and 1.18% according to the requisites of the diagnostic definition. The area under the ROC curve varied from 0.84 to 0.91 according to the diagnosis. Factor models were cross-validated by means of two different random subsamples for EFA and CFA. An EFA suggested a three correlated factor model. CFA confirmed this model. A five-factor model according to EFA and the theoretical five-factor model described in the bibliography were also confirmed. The reliabilities of the factors of the different models were acceptable (>0.70, except for one factor with reliability 0.62).ConclusionsThe diagnostic behaviour of the SDQ in the Spanish population is within the working limits described in other countries. According to the results obtained in this study, the diagnostic efficiency of the questionnaire is adequate to identify probable cases of psychiatric disorders in low prevalence populations. Regarding the factorial structure we found that both the five and the three factor models fit the data with acceptable goodness of fit indexes, the latter including an externalization and internalization dimension and perhaps a meaningful positive social dimension.Accordingly, we recommend studying whether these differences depend on sociocultural factors or are, in fact, due to methodological questions. Using the Strengths and Difficulties Questionnaire (SDQ) to screen for child psychiatric disorders in a community sample. Child psychiatric disorders are common and treatable, but often go undetected and therefore remain untreated. To assess the Strengths and Difficulties Questionnaire (SDQ) as a potential means for improving the detection of child psychiatric disorders in the community. SDQ predictions and independent psychiatric diagnoses were compared in a community sample of 7984 5- to 15-year-olds from the 1999 British Child Mental Health Survey. Multi-informant (parents, teachers, older children) SDQs identified individuals with a psychiatric diagnosis with a specificity of 94.6% (95% Cl 94.1-95.1%) and a sensitivity of 63.3% (59.7-66.9%). The questionnaires identified over 70% of individuals with conduct, hyperactivity, depressive and some anxiety disorders, but under 50% of individuals with specific phobias, separation anxiety and eating disorders. Sensitivity was substantially poorer with single-informant rather than multi-informant SDQs. Community screening programmes based on multi-informant SDQs could potentially increase the detection of child psychiatric disorders, thereby improving access to effective treatments. 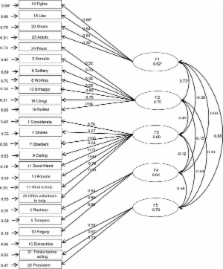 Exploratory factor analysis (EFA) is one of the most widely used statistical procedures in psychological research. It is a classic technique, but statistical research into EFA is still quite active, and various new developments and methods have been presented in recent years. The authors of the most popular statistical packages, however, do not seem very interested in incorporating these new advances. We present the program FACTOR, which was designed as a general, user-friendly program for computing EFA. It implements traditional procedures and indices and incorporates the benefits of some more recent developments. Two of the traditional procedures implemented are polychoric correlations and parallel analysis, the latter of which is considered to be one of the best methods for determining the number of factors or components to be retained. Good examples of the most recent developments implemented in our program are (1) minimum rank factor analysis, which is the only factor method that allows one to compute the proportion of variance explained by each factor, and (2) the simplimax rotation method, which has proved to be the most powerful rotation method available. Of these methods, only polychoric correlations are available in some commercial programs. A copy of the software, a demo, and a short manual can be obtained free of charge from the first author. Copyright statement: Copyright © 2013 Gómez-Beneyto et al. ; licensee BioMed Central Ltd.